Animal head designed as a hook is decorative and practical ,it is perfect for drawing room, Bathroom, Bedroom, Study Room, entrance ect. 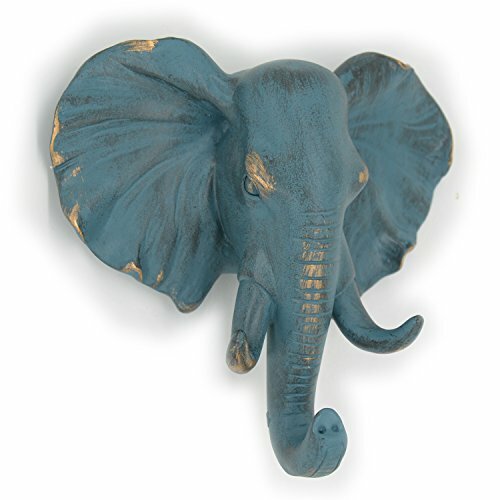 It is made of Resin and very sturdy as a Coat Hook, Hat Hook. you can hang clothes, jewellry, keys , Towels and other things you like, you can use them to build different scenes, creating a great beatiful home. Perfect Gifts for the Wall Art Lover Made of Resin and Keyhole on back for hanging strongly Sturdy quality use as a Coat Hook/ Hat Hook /Key Hook/Jewellery Hook ect. More Group would be better as wall decoration , Perfect for all of wall Size:5"H x 5"W x 2"D; More animal hooks are available: Rhino, Horse, Sheep, Giraffe, Deer etc.